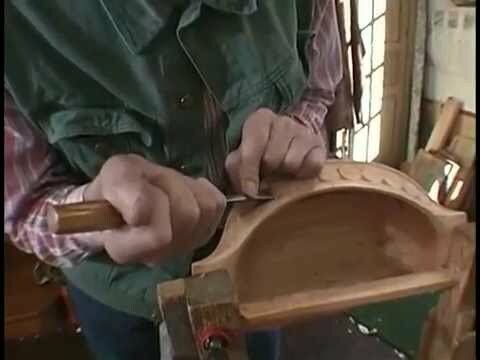 By now, most of you have probably watched the video featuring Bengt Lidström, renowned Swedish architect and bowl carver. Recently, I contacted Drew Langsner in an effort to learn more about Bengt. He informed me of an extensive article about Bengt in a journal published by the Västerbottens Museum in northern Sweden in 1996. Well, that’s a long way to go to get a copy, so for those interested in more of Bengt’s story here’s a link to an electronic copy (thanks to Urban Gelfgren at the Museum). Dozens of pages, and all in Swedish — but the photos are in English. I muddled through copying and pasting with Google Translate. Why, oh why, did my high school not offer Swedish? Anyway, Bengt was born in 1916, one of 15 children. He grew up learning hand skills; when something was needed, the Lidströms made it. Through his career as an architect Bengt celebrated traditional Swedish styles and methods. His work included the restoration of many Swedish churches. Several of the photographs in the article pertain to that work. Bengt retired in 1981 and devoted much of his time to carving, becoming especially known for his wooden bowls. 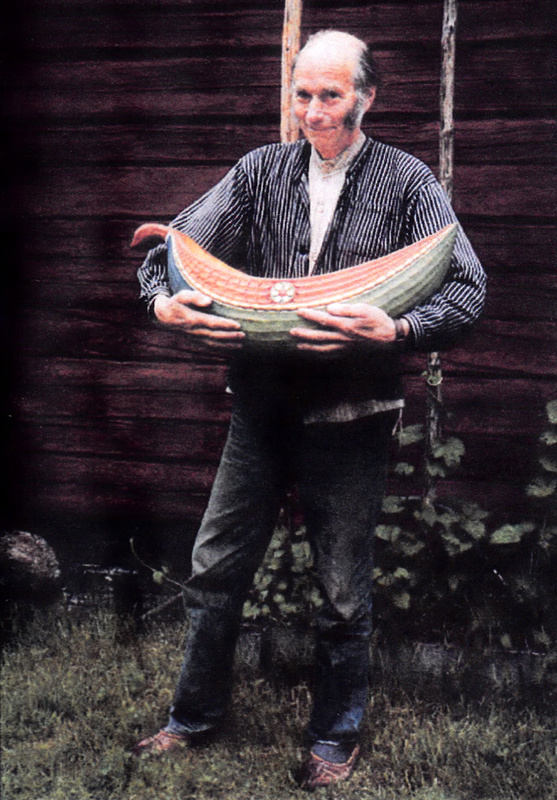 His bowls were inspired by Swedish folk traditions, including the tradition of individual creativity. Bengt began carving “upside-down bowls” by carving into the bark side of the log. Over time, he increasingly decorated his bowls with carved patterns and painted them with vivid colors. I am amazed by the beauty, creativity, and variety in his work. And, admittedly, I have seen relatively little of it. Every once in awhile, I’ll watch the Bengt Lidström video again. Even though I do many things differently, I notice something new every time. As the years go by, I am also more inspired by Bengt’s age at the time of recording in 1998. He was 82 years old, and going strong. Carving keeps you young — mind and body engaged. With Bengt’s age came wisdom evident in his working methods. For example, when he carves the decorative motifs on the side panels, he takes the time to arrange the piece at a comfortable working height to save his back. I’m not that wise yet. Wille Sundqvist is another who drinks from the carving Fountain of Youth. 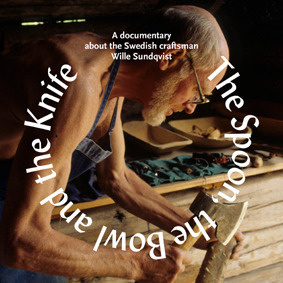 If you’ve not gotten a copy of The Spoon, the Bowl, and the Knife, add it to your Christmas list. And add to it Wille’s book, Swedish Carving Techniques. I’ll have to wait for another time to say more about Wille and his influence. In the meantime, check out these great photos of Wille carving at Country Workshops. Then boldly carve, ageless and shirtless! This entry was posted in bowls, carving, green woodworking, historical reference, holding, paint, Uncategorized and tagged Bengt Lidstrom, Wille Sundquist, Wille Sundqvist. Bookmark the permalink. Thanks I really enjoyed this. I recently gave a talk on traditional sloyd and Willie Sundqvistat a meeting of faculty at the University of Illinois with Scandinavian interests (Heimskringla). I only covered Bengt Lidström with a couple of sentences, but you have shown me that there is a lot or that I could have said, perhaps next year. Interesting, Jim. I wonder if one of those ambitious University of Illinois Heimskringla members would be interested in translating the Bengt Lidstrom article into English? I know that at least I and Geoff (see comment below) would love to read it. Thanks for sharing this Dave. I have watched the video on Bengt a few times also. I may be watching it again soon to see what to put on another side panel bowl. Many of us would love to be able to read that article. First I’ve heard of the man and his work. Thanks for the video, David. Fascinating stuff. It was interesting to hear him say that the bark-side-up bowl carving was his innovation. I had just assumed that it had more distant roots in the Swedish tradition. I’ll be watching for the translation. Look what you started Dave. Maybe a fundraiser for the museum??? I am willing to start translating this. It will probably take a few weeks, but “Jag kan tala och läsa lite svenska. Wow, that’s great, Jim! I didn’t mean to suggest a bunch of work for you. It is a long collection of articles. If the entire thing is overwhelming, perhaps consider the section that seems to be most about his carving (pages 46-53 in the printed page numbers). Regardless, it will be worth waiting for. Yes, I know it is a long document, but I am interested in the whole thing. It won’t be quick, and I will probably get slowed down occasionally. It may be months rather than weeks. I am a beginning beginner-I would love to have a copy of this – Thanks for your efforts – They will help many get to the next level ! Amazing pictures. I would love to walk through some of those churches. I can never get enough of architecture like that. I too will be looking forward to a translation! Hi David: I appreciated the few concessions Brengt made to his age. My back no longer tolerates long sessions with the adze when hogging out material, however,” never give up” remains my mantra.